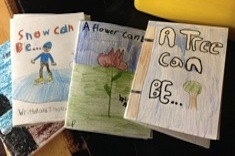 Franki Sibberson shares her favorite books for modeling writer’s craft in her classroom. Prolific children’s book author Laura Purdie Salas explains why you should treat visiting authors like rock stars, with many tips and examples from her writing friends. 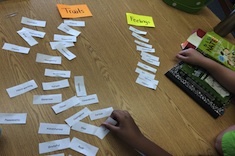 Melanie Swider finds word sorts are a great way to help intermediate students master new vocabulary for describing character traits. This whole-class share session in Lesley Fowler’s fifth-grade classroom is the culmination of a nonfiction writing unit. Over the course of the year, students have moved from complimenting their classmates during these share sessions to writing down specific aspects of the piece they enjoyed or had questions about during the reading. If you are looking for a “peppery” heroine, Mary from The Secret Garden is one for the ages. 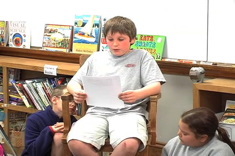 In this video of a lesson in writer’s workshop, Franki Sibberson shows how shared text can be used to help young writers understand character traits and development. Katie DiCesare’s first graders reread a favorite text in pairs to work on noticing the details of writer’s craft.